A craftsman from Santa Cruz Timberframes works on an original timber slated to become part of the re-creation of the Cowell Ranch Hay Barn. Public viewing of the construction begins at 1:30 p.m. with ceremonies and a pie and ice cream social to follow. As UC Santa Cruz celebrates its 50th anniversary, the campus is re-creating the 150-year-old hay barn near the campus entrance. The project has been made possible by a gift from the Helen and Will Webster Foundation. “We see it as a place for people to gather, celebrate, learn, and hope it will inspire other private donors to join the project,” said foundation trustee Alec Webster, a UC Santa Cruz alumnus (College Eight, 2002, Environmental Studies). 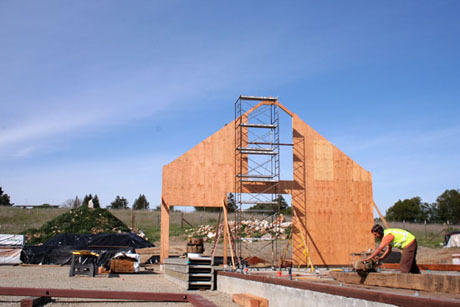 The barn is part of a revived campus entrance and the new home for many innovative environmental sustainability programs at UC Santa Cruz, including the Center for Agroecology and Sustainable Food Systems. The hay barn site lies at the heart of the Cowell Lime Works Historic District. The barn most likely sheltered oxen used to haul wagons that carried limestone to lime kilns and redwood used as fuel for the kilns. Built in the early 1860s, the original barn’s timber frame structure used pegged mortise and tenon joinery, a beautiful and durable construction style widespread on the east coast of the United States in the 19th century but rare in California. The original barn was dismantled piece by piece in 2014 with pieces inventoried and cataloged. The new barn brings together historic timber framing with modern construction. Saturday’s barn raising comes after excavation, soil stabilization, and a new concrete foundation and floor. The front and back ends are constructed with steel and modern wood framing. The internal frame between the ends will be re-created with 10-inch by 10-inch redwood sill plates, and a combination of new and salvaged Douglas fir framing members. The timbers will be joined with mortises and tenons supported redwood braces. The whole system is pegged together using locust wood pegs. Douglas fir beams up to 40 feet long were sourced from the Siskiyou Mountains in Southern Oregon and custom milled. Redwood timbers are from the Santa Cruz Mountains. Approximately two-thirds of the diagonal redwood braces are original and are being reused. 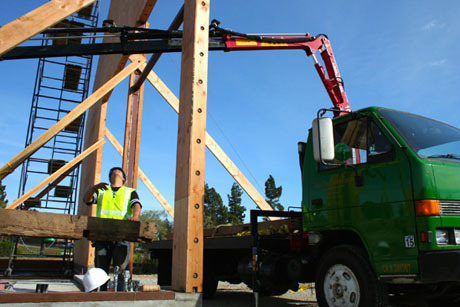 The volunteer team, led by master craftsman Karl Bareis of Santa Cruz Timberframes in Bonny Doon, will include contractors from the Santa Cruz Construction Guild, local woodworkers, and others from UC Santa Cruz. Bareis and his team built the re-created timbers using traditional woodworking techniques at his Bonny Doon yard.